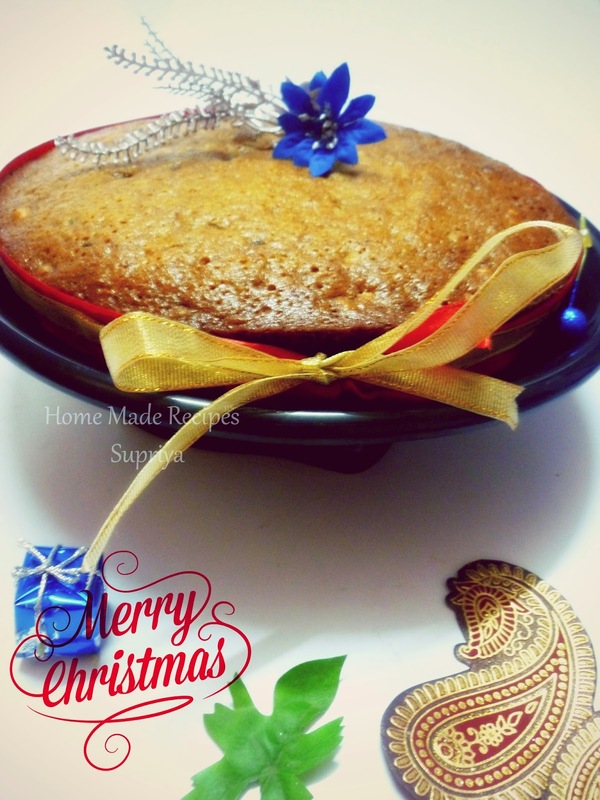 I am bit late to post this delicious Christmas Special cake also known as Fruit Cake or Plum Cake. 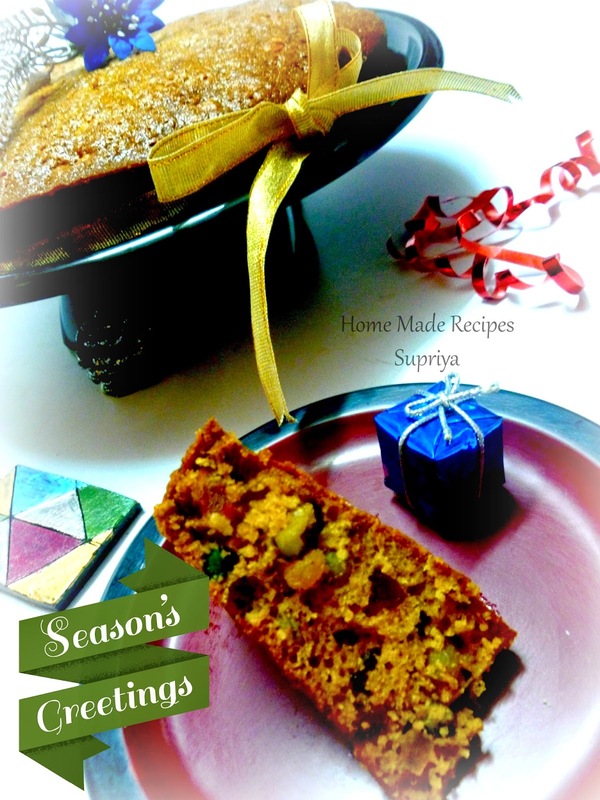 With the note "It's Better late than never", I am posting this Easy Christmas Cake today. Merry Christmas to all. This easy cake doesn't require any soaking of nuts months ahead. The best part of this cake is that its alcohol free and its a substitute for the last minute bakers like me. Because of it's simplicity in baking, it's also called as "Boiled Fruit Cake" or "Bachelor's Cake". Ever since I happened to find this recipe here, I wanted to bake this cake desperately. Last year ,since I was expecting my baby by this time, I couldn't bake one. This year, with no excuses, I tried this one a couple of days back and it was super hit at home. I and my son liked the taste better the next day it was baked though my hubby liked it the same day it was baked. I love the plum cakes but the sad part was that we used to get it only during Christmas seasons. So now, on this cake surely begs to be baked throughout the year at our home. 1. Take a large sauce pan. Add in sugar , water, butter, spice powder and raisins. Mix all these and bring these to a boil on a medium flame. Boil for 5 minutes and then remove from heat and let it cool down to lukewarm. 2. Pour in the lightly beaten eggs to the mixture in sauce pan. Add the sifted flour, baking soda, salt to it and mix. 3. Add in some vanilla extract and other nuts. Mix all together till combined. 4. Pour this into your greased baking tray or pan and bake it in a preheated oven for 45 mins( at 180C) or until a toothpick inserted into the center of the cake comes out clean. 5. Once done, remove it from the oven and let it cool on a wire rack. Cover and store if possible for a day before serving as it tastes better the next day. Note: I have used the regular golden raisins to this. You can combine both dark and golden raisins for this cake. Spices can be adjusted to your taste, adding more or less of each. Taste gets better the next day after it's baked. So have some patience to store some for a day. You can eat it right away too but that's my personally opinion as I liked it the next day. Instead of brown sugar, you can use the regular white sugar too but the color will differ. You can even caramelize the sugar and add. I have not tried this but heard it from my friends who have given that a try.